Cherax quadricarinatus (Redclaw Grayfish) Back in 1985, I started a semi commercial venture breeding Redclaw Crayfish for the commercial market. My set up consisted of four 5,000 litre above ground swimming pools, set side by side with an overflow water exchange feature, a swimming pool pump and a pool sand filter. Water pick up for filtering was regulated from each pool passed down a common pipe to the filter, and from there the water was returned to the ponds via a spray system from above. This ensured that the returning filtered water was well airated for the redclaws. My initial stock consisted of about 400 wild caught Redclaws from Northern Queensland split roughly between the four pools. About three weeks before stocking I seeded each pool with about 10 kilos each of mud from a local dam and cow manure from a dairy farm,to set up the bio eco system that the cray's would need This venture ran well for about three years, I was supplying my restaurant and others with live crayfish an a weekly basis. AND THEN!!! the government started to interfere by imposing strict live fish trading rules and introducing very expensive licensing fees. Unfortunately, The combination of both were enough to force me to close down my enterprise. 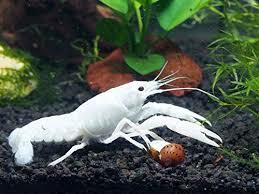 Redclaw are NOT good aquarium tank mates, DO NOT KEEP THEM IN WITH OTHER FISH OR PLANTED TANKS. Although more placid than their other Charex cousins, they can get very agro when they have a mind to. My tip is to house them in a large aquarium 60 cm or larger with plenty of structure for hiding places so as they can get away from each other especially during times when they are moulting. The female also becomes very territorial when berried. FEEDING: They are omnivores but tend to eat more vegetable material, I have known them to munch into driftwood in their tank, they are not good fisherman being slower than other Cherax species, but that does not exclude fresh fish from their diet. They do like chicken pellets, a very small piece of red meat , worms, and fish. I found that water temperature at around 25C to be good ( don't go up to 31C) good filtration with plenty of surface movement. PH between 6 and 7.5 although they can stand higher. 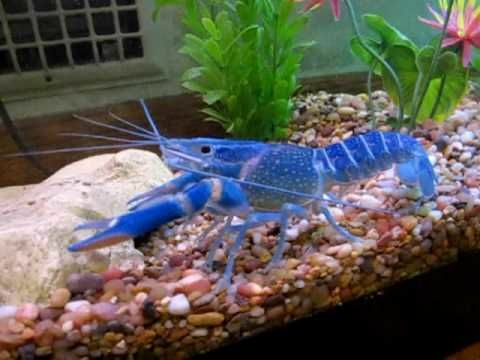 Selective Breeding : I found the Redclaw to be relative easy contender for selective breeding ,having success in breeding a beautiful deep blue, pale blue, a deep green and an almost albino over successive generations. I also found that sometimes they will revert back to their original colours when severely stressed. 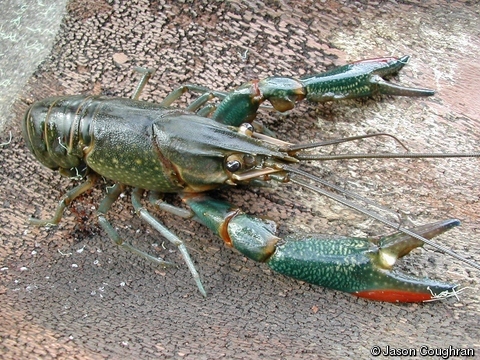 I hope that this article will help some of you who are contemplating keeping Redcaw Crayfish.